Ethiopian Airlines has grounded its fleet of Boeing 737 MAX 8s following the crash of flight ET302 on Sunday that killed all 157 passengers and crew. 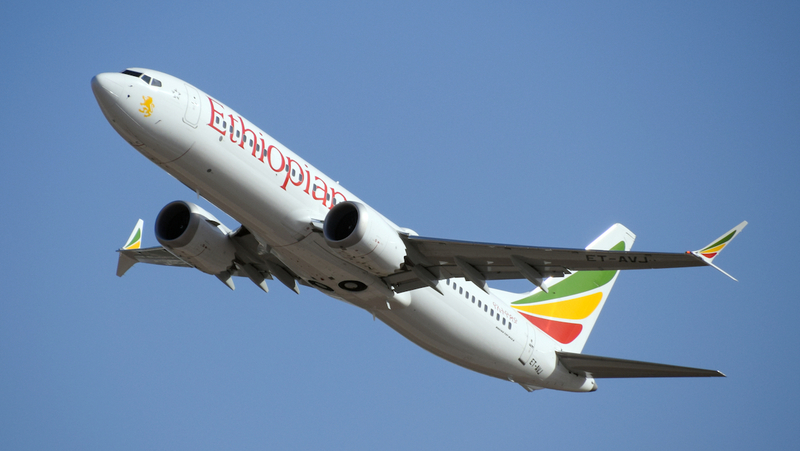 The accident occurred on 737 MAX 8 ET-AVJ, which took off from Addis Ababa’s Bole International Airport at 0838 local time on Sunday, March 10, as flight ET302 bound for Johannesburg. However, the flight lost contact with air traffic control six minutes later. Ethiopian Airlines group chief executive Tewolde GebreMariam said on Sunday there were no survivors among the 149 passengers and eight crew. “It is too early to speculate the cause of the accident and further investigation will be carried out to find out the cause of the accident in collaboration with all stakeholders including the aircraft manufacturer Boeing, Ethiopian Civil Aviation Authority and other international entities,” GebreMariam said in a statement. VIDEO: Ethiopian Airlines group chief executive Tewolde GebreMariam speaks about the crash of ET302 from the airline’s Facebook page. GebreMariam, who visited the scene of the crash, expressed profound sympathy and condolences to the families and loved ones of passengers and crew who lost their lives in this tragic accident. Ethiopian Airlines said the pilots at the controls were senior captain Yared Getachew with more than 8,000 hours of flight time and first officer Ahmed Nur Mohammod Nur, who has about 200 hours experience. The aircraft ET-AVJ was delivered to Ethiopian Airlines in the November 2018 and and was one of five 737 MAX 8s in the fleet. The airline said ET-AVJ has a “rigorous first check maintenance” on February 04, 2019. On Monday, Ethiopian Airlines said it had decided to ground its 737 MAX 8 fleet effective immediately until further notice. “Although we don’t yet know the cause of the accident, we had to decide to ground the particular fleet as extra safety precaution,” the airline said. Also, the Civil Aviation Administration of China (CAAC) said it has suspended commercial operations of the 737 MAX among Chinese carriers. It said in a statement on its website the decision was in line with the principle of zero tolerance for safety hazards and the strict control of safety risks. Boeing said in a statement on its website the company was “deeply saddened” about the crash. “We extend our heartfelt sympathies to the families and loved ones of the passengers and crew on board and stand ready to support the Ethiopian Airlines team,” the Boeing statement said. The United States National Transportation Safety Board (NTSB) said on Twitter would be sending its own staff to assist with the investigation. “The NTSB is sending a team of four to support the Ethiopian Accident Investigations Bureau’s investigation of Sunday’s crash,” the NTSB statement said. The NTSB is sending a team of four to support the Ethiopian Accident Investigations Bureau's investigation of Sunday's crash. The NTSB team has expertise in systems/structures, powerplants and operations and will be assisted by technical advisers from FAA, Boeing and GE. While investigations into the cause of the Ethiopian Airways crash are only just getting underway, media reports indicated the pilot has requested to turn back to Bole International Airport due to technical difficulties. The incident is the second fatal accident that have involved the 737 MAX 8 in the past six months. In October, Lion Air flight JT610, operated by 737 MAX 8 PK-LQP, plunged into the Java Sea shortly after the aircraft took off from Jakarta to Pangkal Pinang. All 188 people on board were killed in the crash. In the Lion Air case, data from flight tracking website Flightradar24 showed the 737 MAX 8 reached an altitude of about 5,500ft before a rapid descent. In response to the accident, the United States Federal Aviation Administration (FAA) issued an emergency airworthiness directive (AD) on November 7 to operators of Boeing 737 MAX aircraft, which called on them to address procedures in the event of pilots receiving erroneous angle of attack sensor information. The AD followed Boeing issuing an operations manual bulletin (OMB) that asked 737 MAX operators to remind pilots of how to handle “erroneous” information from the aircraft’s angle of attack sensors. The investigation has also canvassed the role of the Maneuvering Characteristics Augmentation System (MCAS) that was introduced on the 737 MAX, which is the fourth generation of the Boeing 737 program. The MAX features new generation CFM International LEAP-1B engines, as well as a new flightdeck, fly-by-wire spoilers and new technology winglets compared with the 737 NG. It was added to the 737 MAX’s systems following some design changes from the 737 NG, with the engines a little further forward and the nose gear a little longer on the MAX. Some airlines and pilots groups have claimed information on the stall recovery system was not included in documentation for the 737 MAX. However, Boeing has rejected the claims, with chief executive Dennis Muilenburg saying it was included in the flight crew operations manual, according to a memo to staff seen by aviation news website The Air Current. According to Boeing’s website, the company, as of January 31 2019, had received 5,111 orders of Boeing 737 Max series aircraft, and had delivered 350 to various airlines globally. Locally, Virgin Australia has 40 737 MAX family of aircraft on order. It was due to receive the first 737 MAX 8 in late 2019. The order also included 10 737 MAX 10s to be delivered from 2022. Boeing’s other two 737 MAX customers in Oceania are Air Niugini, which put pen to paper in February 2016 for four MAX aircraft arriving from 2020, and Fiji Airways, which received the first of five 737 MAX 8s on order in December 2018. Meanwhile, Qantas was expected to run a competition between the 737 MAX and A320neo at some future point for the replacement of its existing 737-800 fleet. If its Boeing I aint going! Redesigning a 1950’s a/c has got to have its problems, and it sadly shows! Airbus got this tech right long ago, and frnakly, I will not fly on any Max aircraft period. what a silly comment. So when Qantas wrote off a 747-400 when it crash landed at Bangkok in September 1999, you would no longer fly a 747 ? @ David, Qantas repaired that aircraft it was not written off. Stop trolling. You have no idea what happened with this aircraft. Wait for the results of the crash investigation before you make judgement. Seems that we have all but forgotten about the pitot tube failures the Airbus A330 had. We have also dismissed the software fault related to the ADIRU that caused A330’s to perform an commanded pitch down. It doesn’t matter whether it is Boeing or Airbus, mistakes are made as humans are fallible no matter which organization they work for. What is key is that we fully understand the issue, rectify the cause and learn from this to reduce the likelihood this occurrence in the future.